I am almost 72 yrs old, I've noticed lines around my mouth, saggy jowls, and turkey neck and I hate it. I can't stand looking at myself in the mirror. I have always massaged my face in circular motion when cleaning or applying cream. But what more can I do to fix or at least help stop it from looking worse? Thanks for your question about tightening the lower face and skin. Massaging your face each time you clean it or apply creams is great for your skin and can help increase healthy blood circulation. Keep doing it and consider massaging your lower jows and neck too. But, you can take this one step further and incorporate some simple facial exercises to firm up underlying muscles and skin which can help give your whole face a firmer, smoother and more lifted appearance. Anti-aging creams and serums (like Retinols) are very important to help increase cell turnover so you bring fresh new cells to the surface. This does wonders to help improve your skin's appearance. But it can only do so much. If you want your face looking younger and more lifted - you really need to build up underlying facial muscles, which can also help smooth out the skin even further. 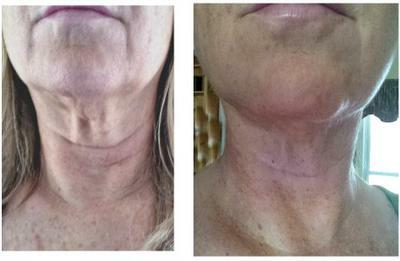 I'm in my late 50s and started noticing sagging skin around the jowls and neck as early as my 40s! I knew surgery was out - too scary and fake looking. So I started researching my non-surgical options and realized that facial exercises were the most effective and cheapest way to go. But I had a hard time finding one that I liked or one that I can fit easily into my schedule. Some face exercise programs were too difficult, some too time consuming and some were just too rough (meaning you really had to tug hard on the skin and that scared me). As a result I could never stick with one long enough to see if they really worked. Until I found the CFF program. I really like it and was able to do it weekly, which you need to do if you want to see results. I also started documenting my progress with pictures so I can be sure it was working. Guess what? These facial exercises really do work! Click on this link to see my before and after pictures. You can also learn more about this program at this link. January 25, 2016 marks 1 year of doing the exercises 3 times a week for 15 minutes a day. And I'm still seeing improvements. But you have to commit to doing them on a regular schedule - and I think it's worth it.